Utah State’s offense is back, and on Saturday afternoon it was better than ever. It only took the Aggies’ 5:55 of possession to put together their first five scoring drives of the game. With a 100-yard interception return for a touchdown by Shaq Bond mixed in, Utah State held a whopping 42-3 lead over New Mexico. 11:33 remained in the second quarter. 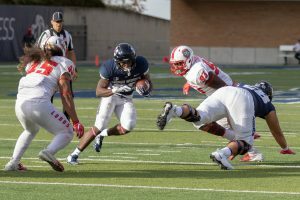 Behind the direction of Jordan Love, the Aggie offense put up video game-worthy numbers on their way to beating the Lobos 61-19 at home for their seventh-consecutive victory. USU’s offense set their all-time school record for most yards in a single game with 704. It was a record-setting day for Love as well; the sophomore amassed a career-high 448 passing yards and tied his career-high with four passing touchdowns, all in the first half. The win gave Utah State (7-1 overall, 4-0 Mountain West) their best start since 1965. Bond’s interception was the turning point in the game for Utah State. The Aggies held a 7-3 lead with New Mexico (3-5, 1-3) knocking on the door. On second down at the USU seven-yard line, Bond jumped a flats route right on the goal line. He snagged the Sheriron Jones pass and took off, making a Lobo miss at midfield on his zigging and zagging field-length return. It was all Aggies after that. Love hit Jordan Nathan for a 17-yard score on the next drive. Love and the Aggies followed up with another scoring strike on the next possession, this time from 28 yards out to Ron’quavion Tarver. The senior caught seven passes for a game-high 112 yards. Jalen Greene joined Tarver in eclipsing the century mark in receiving yards, with four catches for 108 yards. Dax Raymond, making his return after missing three weeks with a hand injury, was on the receiving end of the next TD pass from Love. 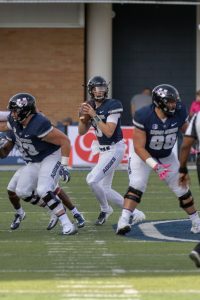 The sophomore quarterback ran one in himself on the next possession to put USU up by 39 points early in the second quarter. USU’s 52 first-half points were a season-high and the most the Aggies have scored in the first half since 1991, according to available records. When the Aggies struck, they did so quickly. Three different times Utah State put together scoring drives that took less than 60 seconds. The Aggies have done that 17 times in 2018, good for the second-most in the nation, trailing only Alabama. It wasn’t all about offense – USU’s defense put up some numbers themselves. They limited New Mexico to only 71 yards on the ground and allowed the Lobos only 5 of 15 third-down conversions. 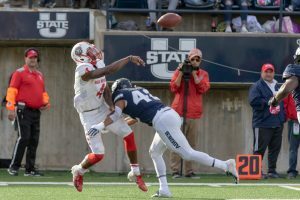 Utah State forced five turnovers – a fumble and four interceptions. Chase Nelson punched a ball loose and Chance Parker recovered it, while Bond, D.J. Williams, Logan Lee and Kevin Meitzenheimer all picked off passes. It was a special day for USU linebacker Suli Tamiavena, who got to play against his twin brother, Siti. Suli recorded seven tackles, a sack, and two tackles-for-loss. Siti, also a linebacker, was responsible for five tackles. Wells and the Aggies have been focused on taking their season week-by-week, with the vision of playing for a Mountain West championship. They’re nearing that goal, with regular season games against Hawaii, San Jose State, Colorado State and Boise State remaining.